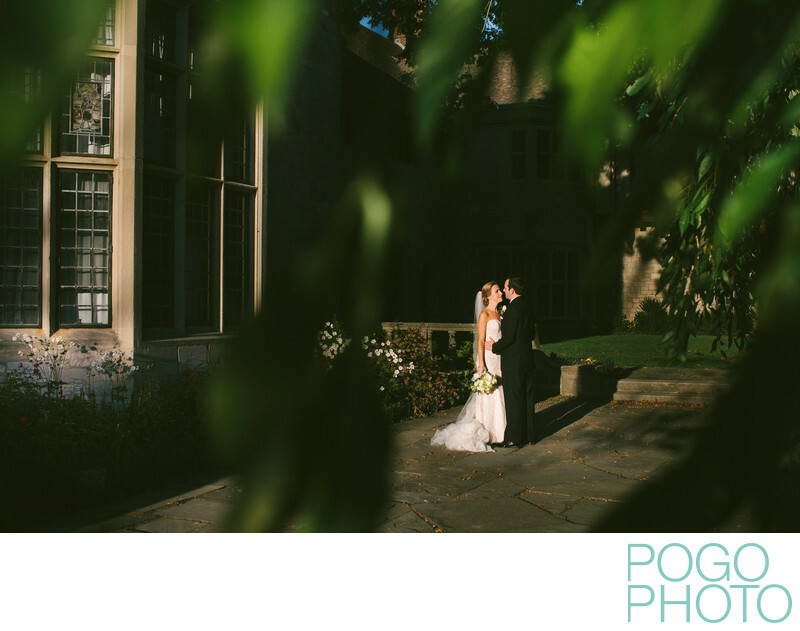 This image, taken during a first look, incorporates the historic home that served as a beautiful backdrop for the couple's wedding portraits, one of the many impressive structures listed on the National Register of Historic Places. First looks may have been slightly taboo last century, but we have seen a majority of our couples opt to participate what may be the newest mainstream wedding tradition. We refer to the two options as a first look and an aisle reveal. The traditional aisle reveal is associated with so much excitement and anticipation, revolving around the exact moment when the bride and groom see each other for the first time. That moment still exists during a first look, except that is it much more private and personal. Asking former clients about their first looks long after their wedding days has open our eyes to just how great this option can be. The aisle reveal has long been the standard on wedding days, with some of the older guests and family members having a hard time even fathoming that couples could see each other ahead of time. Some of the interesting feedback our clients have given us is that the excitement of that moment is not diminished in the least by doing a first look ahead of time. In fact, having the opportunity to get beyond some of the nervousness of the day and reconnecting with your significant other just before the most important moment in your relationship has allowed couples to enjoy the ceremony more. The alternative, especially for religious or traditional weddings, is to meet each other at the head of the aisle and not have much of a chance to talk to one anther until after the ceremony; in some longer ceremonies, this can be an hour or more of sneaking peeks and wishing you could talk to your best friend. First looks can be just the two of you, with the two of us observing from a non-distracting distance. We have seen couples choose to have specific important people observe from afar, like the mother and father of the bride, the groom’s parents, and sometimes siblings or a couple of very close friends. Wedding parties are also sometimes invited to observe, usually out of earshot, and we always gently remind the bridesmaids and groomsmen to be relatively quiet and respectful, as this is an important and private moment. The maid of honor and best man can step up and keep the rest of the gaggle in line if it's a larger group. While first looks can happen basically anywhere, having the option to incorporate anything listed on the National Register of Historic Places adds an element all its own. We don’t just talk the talk, we walk the walk. We were married at the Sumner Mansion Inn in Em’s hometown of Hartland, Vermont, which was built in 1807 and added to the National Register in 1988. While there have been over one million properties listed since its 1966 inception, a state like Vermont and its surrounding region of New England has many more than our other home, relatively newly-built South Florida. Having any one of these properties as a backdrop can enhance the feeling of a wedding day in its entirety, not just during first look portraits, should you decide on this wonderfully personal new wedding tradition. 1/4000; f/4.0; ISO 400; 35.0 mm.